MadisonWineScene (MWS) recently interviewed Mike Boss, Director of Operations of the Blue Spoon Cafe (http://www.bluespooncafe.com/) in Prairie du Sac, Wisconsin. A previous post described Blues Spoon’s retail offerings. This post will discuss Blue Spoon’s by-the-glass offerings and their wine tastings. MWS: How do you pick the wines that you offer by the glass? Mike: The offerings change frequently. They obviously have to fall into the right pricing category to start with because of two things – our glass pour is larger than most -- we pour a 6 oz. glass and so we get four pours out of a bottle, typically our competitors will get five pours out of a bottle; the other is that we want to keep the price between $5 and $8 a glass. So that determines the category of wines that you can choose from and then I just go through my inventory – what I have got, what I am interested in, what I want to introduce. This summer I will be introducing the next level of wines by the glass that will be in the $10 - $15 range to afford our guests an opportunity to enjoy a better wine by the glass. By doing that I will be more willing to open up a $30 bottle of wine to pour by the glass and charge $12 per glass. Typically, most restaurants want to pay for the bottle on the first pour -- we don’t quite do that – we are not quite that aggressive in our pricing. MWS: What percentage of wine sales is by the glass vs. bottle sales? Mike: A great percentage is by the bottle. MWS: With bottle sales how do you keep your prices competitive with the bigger wine stores? Mike: We just do. It does no good to overprice it and have it sit on the shelf. MWS: How do you decide what wines to feature with your monthly wine-tasting events and how successful have they been? Mike: A lot goes into it. I start with a theme and then I start researching the topic. It’s fun for me because if I am going to be the presenter it requires that I spend a fair amount of time learning what I am going to be talking about. In a lot of cases it is a lot of new knowledge to me. For instance, one tasting was on Piedmont – the Killer B’s I called it - Barolo, Barbera, Barbaresco. Obviously I was limited to what I could get from my distributors, so I asked them what they had from Piedmont and once I heard back from them I went through their list, and compared that to what I had in stock and came up with a combination of wines that I thought was going to fit the price – usually $30 a person – it has got to be a value for the customer but I also have to make money at it so I couldn’t offer 12 Barolos – so it had to be a mix of price points. Frequently I will have a distributor’s rep, usually from General Beverage, come out and lead our tasting, and in exchange they like to see their wines being featured. But I am also sensitive that they have a limited lineup and I can’t always feature just their wines because I want breadth and depth in the lineup that I offer. We get between 30 and 50 people at our tastings and we give them an opportunity to purchase wines the same night and we sell anywhere from 15 to 25 cases of wine that night. They come prepared to buy. [MWS: See posting of 15 April 2011 for a review of the Killer B’s wine tasting]. 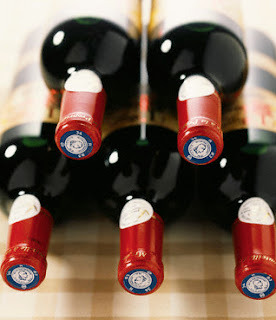 MWS: What are the most popular selling wines? Mike: Number 1 is Wollersheim’s Prairie Fume. We sell a lot of Wollersheim wines, by virtue of their popularity and our proximity to their winery, and our relationship with the owners of the winery. Generally it’s a broad range of wines that are in the $15 or less category that we sell the best, when it comes to how many bottles we sell. MWS: Disappointments – wines that haven’t done as well as you thought? Mike: Chateauneuf-du-Pape. Even when we had our restaurant in Middleton we tried to feature Chateauneuf-du-Pape on the wine menu and we couldn’t sell it. People don’t understand it; don’t appreciate it for what it is. Personally it took me 2 – 3 years to get my arms around it and to decide that I liked it. It required a trip there to come to grips with how I really felt about the wine. I spent the whole day at Domaine Grand Veneur with the owner and winemaker, which was very educational and informative. So I came back from the Southern Rhone and laid into a bunch of labels, three different vintages, wonderful selections – and I am still trying to sell them. They may end up in my cellar at my personal cost. There is a small group of people who are Chateauneuf-du-Pape enthusiasts. MWS: Surprises – wines that have sold better than you thought? Another was the Guenoc Victorian Claret which normally sells for $18 but last year I was able to get a special deal from General Beverage and price it for $10. I marketed it as my Wine Pick of the Year and sold 30 cases of it. I need to come up with more Wine Picks of the Year! MWS: Do you carry the Haraszthy Zinfandel for its regional significance? MWS: How many people realize the significance? Mike: The locals do. Wollersheim has a Case Club with 10,000+ members and their enthusiasts are tuned in to the history of the winery, so a lot of people who visit us after visiting the winery, they know about the Haraszthy name. Love the fact that the Blue Spoon offers wine by the glass and the bottle at a fair price! The tastings are great as well. Rivers are not necessarily only for sheltering inhabitants and providing water to all living things, furthermore, it soothes people by presenting invigorating river attractions. Rivers also offer an ideal spot for excitement. Will Bordeaux 2011 Be Remembered for Whites? - There has been a tremendous amount of excitement in the tasting rooms and cellars of Bordeaux that 2011 is shaping up to be a very good year for white wine.